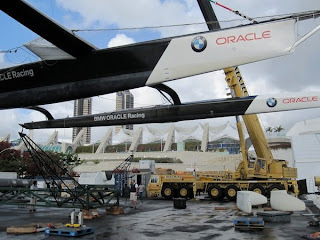 Over the weekend the wing came down and was removed from the BOR 90, which itself was then hauled from the water on Saturday afternoon. Most of the team were given a hard-earned day off on Sunday. But Monday means back to work. This week, the team is beginning its preparations to ship out from San Diego. And while the base is beginning to be packed up, some minor modifications are being made to the BOR 90. 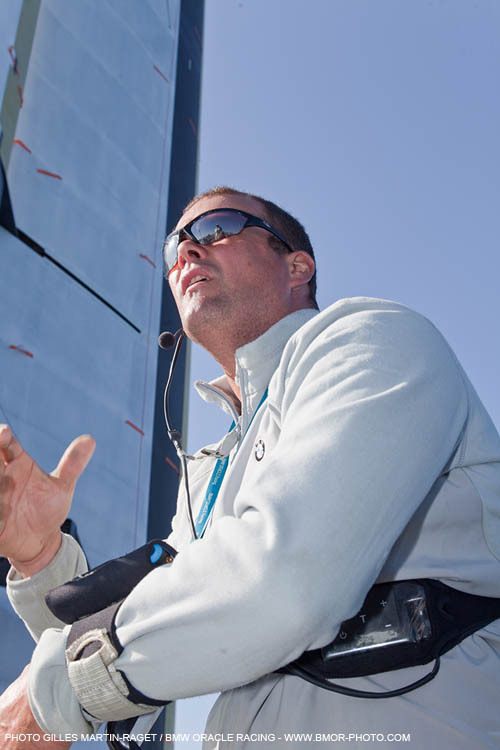 "Moving from a soft mainsail to a hard wing sail was a massive, but successful upgrade," explains team CEO Russell Coutts. 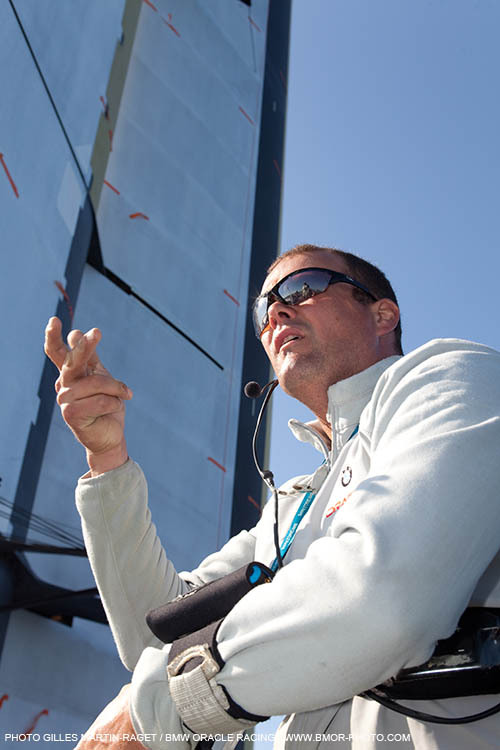 "We’ve sailed for nearly three weeks in the new configuration and we've learned a huge amount in this time. "There is some fine-tuning of the boat to the wing and we're taking the opportunity to make these changes before the boat is shipped to Valencia." 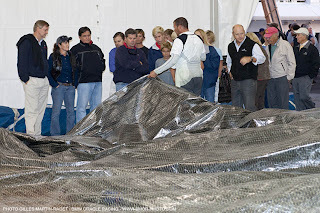 The trimaran is currently enveloped in a custom-built tent where the work is taking place and where the boat will also be prepared for shipping. Dirk de Ridder - aka 'Cheese' - is the mainsail trimmer on board the BOR 90. 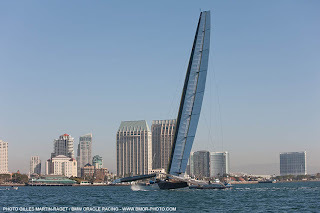 Except now, there's an enormous hard wing sail where his traditional soft mainsail would normally be. 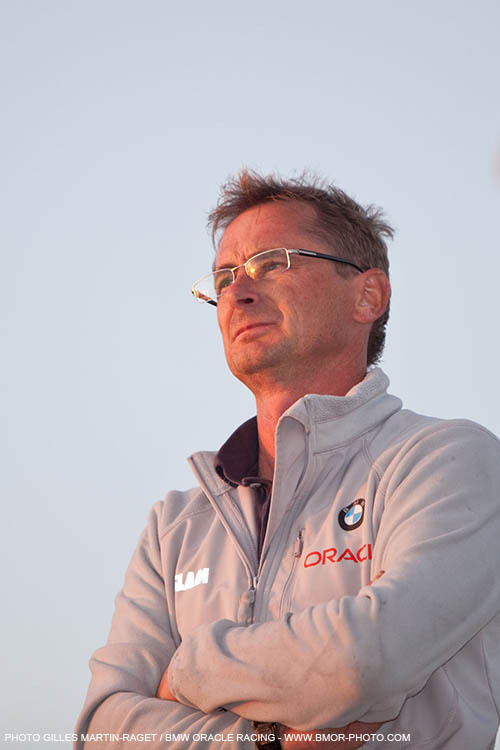 A veteran of three round the world races, he has previously been with AmericaOne and BMW ORACLE Racing in the America's Cup. We caught up with him over the weekend following the final testing session in San Diego. Q: How has using the wing sail changed what you do on board the BOR 90? A: The wing has changed my job quite a lot. 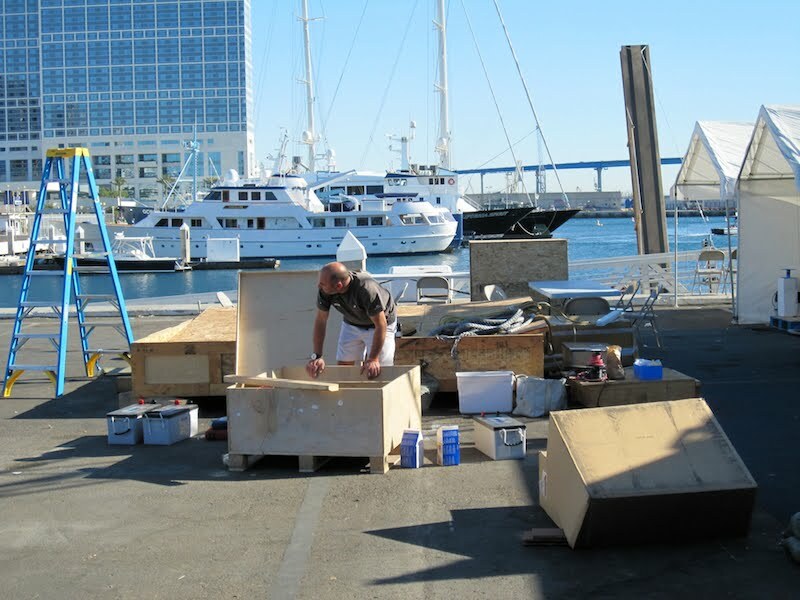 The biggest difference for me is that the loading of the boat is completely different. You don't have any mainsheet loads anymore; that's disappeared. And you rely much more on the instruments than on your eye. The first few days were difficult... I confused myself sometimes by thinking of it like a soft sail and it's not a soft sail. 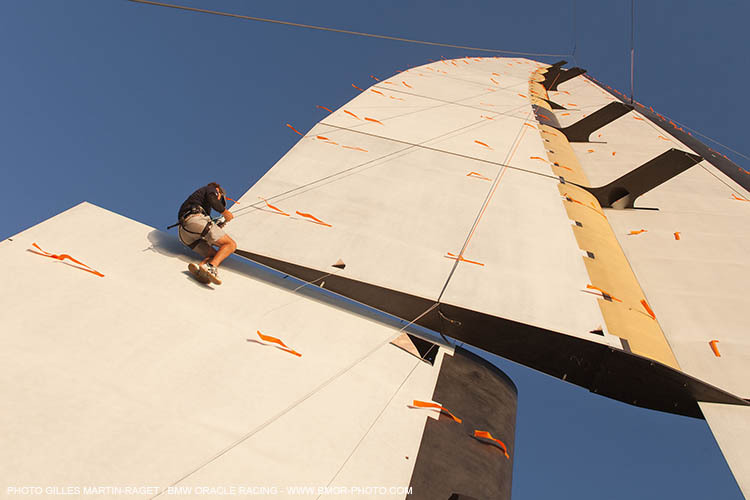 Q: There are dozens of orange 'tell-tales' on the wing sail. Do you use them the same as you would with a traditional mainsail? A: You do, but you can't see through the wing, so I work closely with Joey Newton (AUS), who tells me whether we have connected flow on the leeward side or not. Especially downwind, he's my vision and he tells me how we're going. Q: How was the final week of testing here in San Diego? A: We had a few really good days to close this testing session. They were long days and we did a lot to verify targets and experiment with a few things, so it was a successful week. Q: Your last session on Friday took place in the bay, on a holiday, with hundreds of other boats on the same patch of water. From on board the chase boat, it seemed very crowded. Were there any nervous moments? A: It was incredibly busy on the harbour and with a soft sail, you would never have contemplated doing that. But with the wing sail, you can stop so quickly and move the boat around so easily, it's much safer. 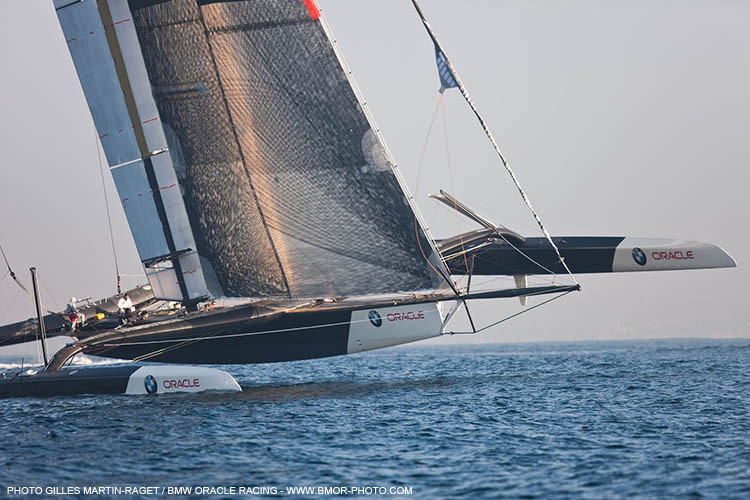 Q: Do you enjoy sailing with the wing sail, or is it too different from what you normally do? A: I love it. I mean look at it. It's enormous. It's never been done before at this size. We've only scratched the surface on what it can do. There's massive potential to improve on it still. This came out of the box very well, which makes our life easier, but you have to stop thinking of this as a soft sail - it's very different. The BOR 90 is out and resting on its cradle. Work continues throughout the afternoon, with Sunday a scheduled day off for much of the team. The wing is out of the boat and onshore. The BOR 90 is scheduled to come out later today as well. 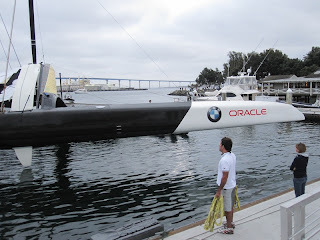 Tom Ehman (USA), files this video report with the blog, on Saturday morning, from dockside in San Diego. So it does rain here. Who knew? We haven't had very much poor weather over the past couple months in San Diego, but Saturday morning is wet and much cooler. The wing sail is scheduled to be lifted out of the boat today, and a group assembled at 0600 this morning to get to work. We'll see if the weather changes those plans. 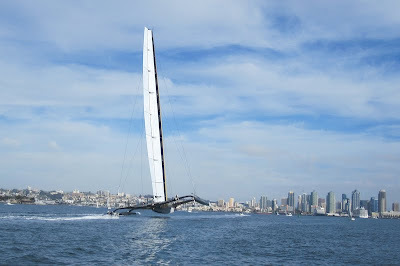 The wing sail is down and the BOR 90 is dockside in San Diego. What a month it's been. 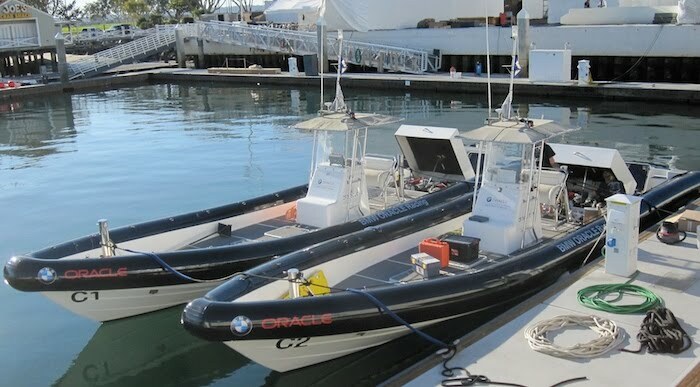 There were plenty of electrons moving about on memory cards today as the BOR 90 took to San Diego Bay for its final testing session in the United States. With Friday being a holiday here, the bay was crowded with pleasure craft and it seemed as if everyone wanted a picture of the giant trimaran as it flew past. 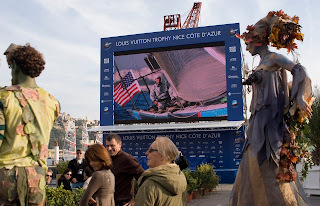 In the light breeze and flat water, Jimmy Spithill and crew deftly manoeuvred the BOR 90, at speed, through the congested bay. Judging by the GPS on board our chase boat, speeds in excess of 20 knots were the norm when the middle hull left the water. It was an impressive sight. The wing is due to come down tonight and be lifted from the boat on Saturday morning, weather permitting. 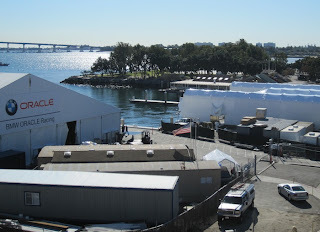 The last of the San Diego testing sessions is scheduled to take place this afternoon. The BOR 90 will head out for a final sail before it returns to base to be prepared for shipping. 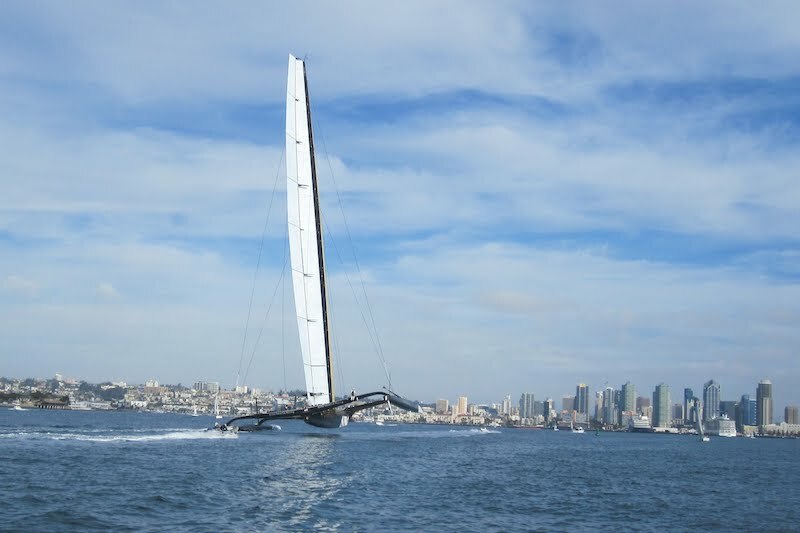 If you're in San Diego, you can catch the final sail inside the Bay, beginning early this afternoon. Thanksgiving dinner at a local hotel on Thursday night was well attended by team members and family. It was a rare chance to pay tribute to our families and pay tribute for the support they give to us. 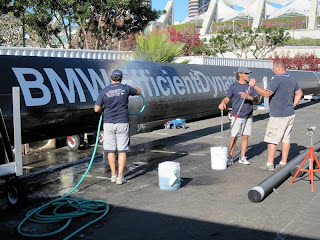 While the BOR 90 is at sea on one of its final testing sessions in San Diego, the rest of the team is cleaning, organising, packing and working up an appetite for tonight. It's a gorgeous late November day here in San Diego... which is something else to be thankful for. 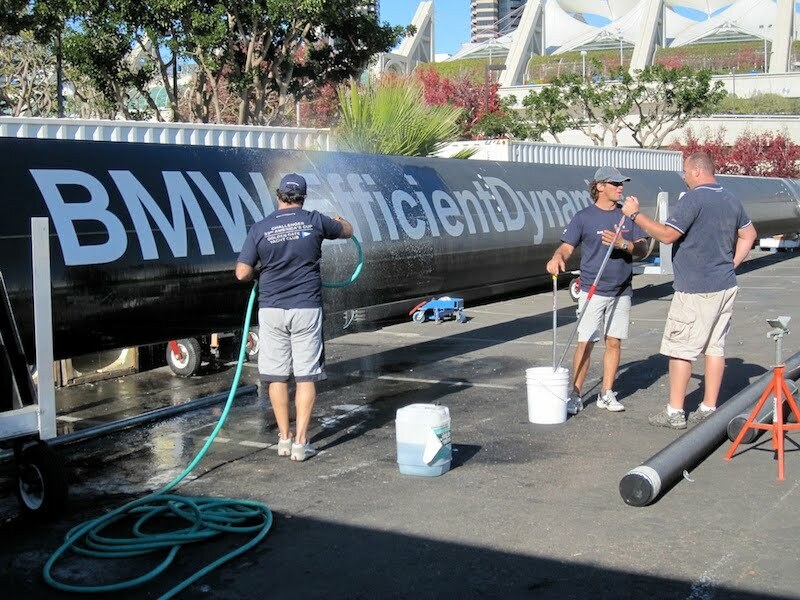 It's Thanksgiving day in the USA today, a holiday for most, but not for your BMW ORACLE Racing team. More testing is scheduled today - this was the view from the convention centre as I trundled down the stairs at 08:30 this morning. They were off the mooring a few minutes later. But that's not to say there won't be any observance of the holiday. This evening, the team will convene for Thanksgiving dinner. And yes, there will be wings on the menu. 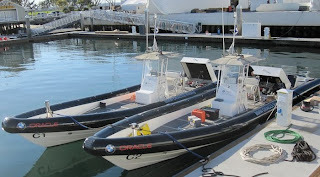 Kiki Karcher (FRA, shore team), was the tender driver on Monday as the BOR 90 resumed testing inside San Diego Bay. Here he is, being interviewed by Francois Jeannet of Swiss TV... The BOR 90, with its towering wing sail is in the background. 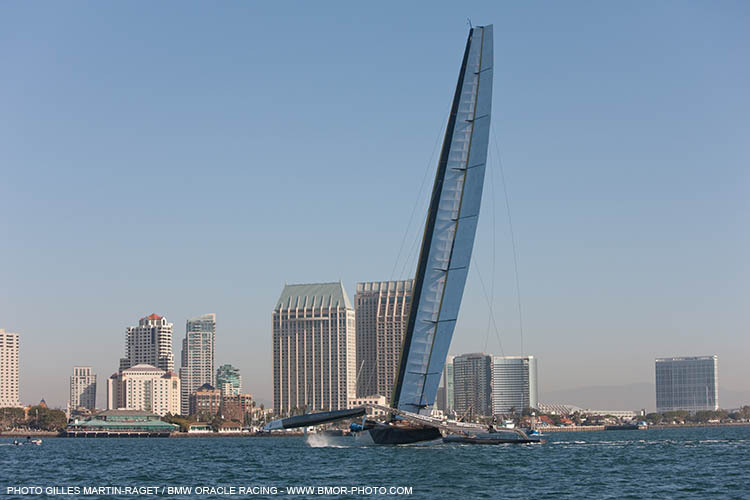 The BOR 90 will be sailing in San Diego Bay today due to wind conditions. As I type, the boat has just docked out, you can follow live now (1050 PST/1350 EST/1950 CET) thanks to the Fox 5 San Diego webcam, here. 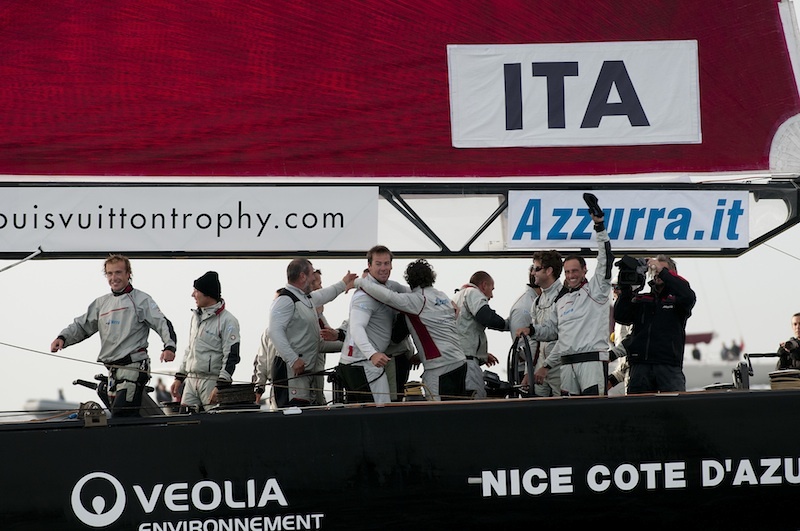 A big congratulations to Italy's Azzurra sailing team who swept Emirates Team New Zealand in the 'first to two' final of the Louis Vuitton Trophy in Nice. 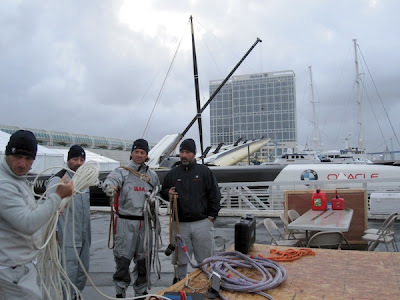 Despite challenging weather conditions, race officer Peter Reggio and his team did a magnificent job of getting through the schedule and the racing was compelling and exciting. 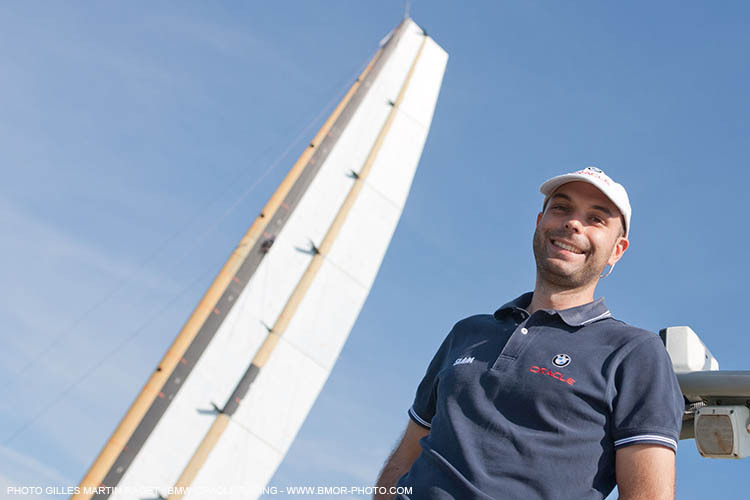 Italian skipper Francesco Bruni and his crew sailed flawlessly in the light conditions on Sunday to surprise the highly touted Kiwi team. The BOR 90 returned to base in San Diego on Saturday for the first time since the wing sail was installed. Up until now, the boat has been on a mooring a few hundred metres from the dock. Recovering blogger Tom Ehman (USA) was there with iPhone in hand to document the arrival and speak to some of those involved in the creation of our beautiful wing. What happens at night? How about maintenance? How do they trim it? By Jane Eagleson (USA) in San Diego. 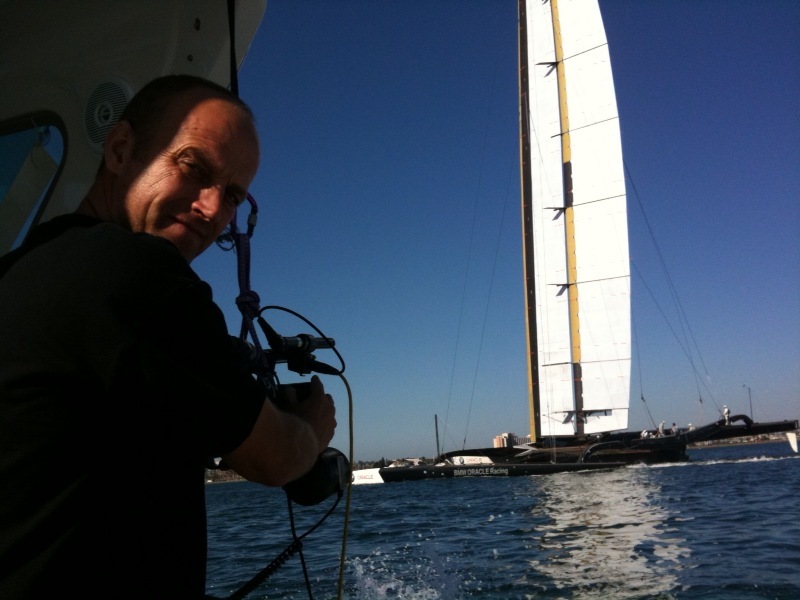 Craig Phillips (AUS) and his sailmaking team are discovering the new world of aerial sail maintenance and repairs. “We thought the wing would lighten our load but it hasn’t. We are responsible for all repairs and maintenance on the skin. “It takes what we would call car-park sailmaking to a new level,” Craig said while looking out from the traditional sail loft to his team working suspended in the air on the wing. The team had a dockside maintenance day on Saturday. This was the first time the boat platform has returned to the dock from its mooring since the wing was installed two weeks ago. The platform was carefully guided back to the team dock with the wing lowered. 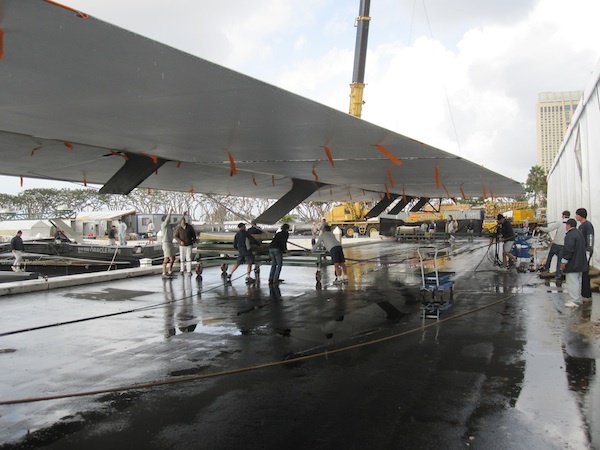 Once at the dock, two cranes lifted the wing to allow for maintenance while the wing was suspended above the boat. Most of the team will take Sunday off before returning to testing on Monday. BMW ORACLE Racing may have finished racing at the Louis Vuitton Trophy, but the event continues with the top four places at stake. On Saturday, the Synergy team earned a famous win over TeamOrigin to claim third place, with the British entry staking out fourth position on the leaderboard. On Sunday, Emirates Team New Zealand is scheduled to meet Azzurra in what organisers hope will be a best of three Final to determine the winner. The weather may have other plans, so winning the first race will be critical - it may be the only match they sail. In the meantime, it's been a busy Saturday at the race village. Photographer Bob Grieser sent in these images from one of his walkabouts in the village. This afternoon we hosted the Board of Directors of the San Diego Yacht Club and their families for an up close look at the BOR 90 and a tour of our team base. Larry, who sailed on the 90 today, greeted Commodore Andy LaDow, expressing his and the team's appreciation for the Club's support during the 15 months we have been based in San Diego. Russell was surrounded by the SDYC junior sailors who were accompanying their parents, and after a photo op, Russell asked Julien Di Biase (SUI, logistics) to run the kids out to the yacht (at its mooring) on a chase boat so they could go aboard. Needless to say, the junior sailors were thrilled, and they will have an interesting experience to share with their friends at school on Monday morning. 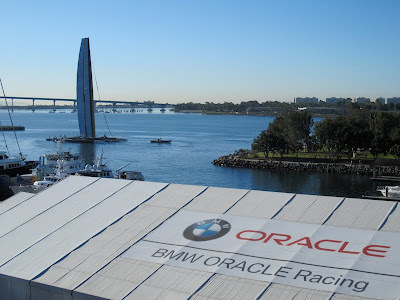 BMW ORACLE Racing team left for their race as the sun was rising this morning and arrived back at the dock under the last light of the day. 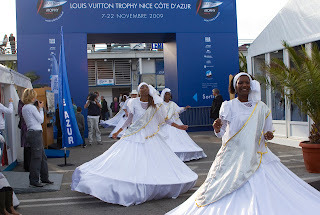 The first race was a good win over Team French Spirit. 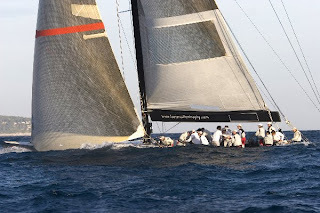 After a long break, and lunch ashore, the team returned to the Bay of Angels to race ALL4ONE for fifth place on the leaderboard. 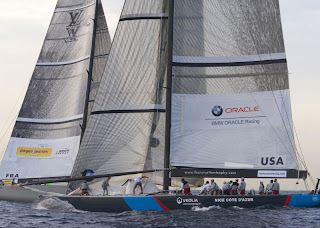 The guys had a good start and worked ALL4ONE out towards the starboard tack layline, but the final approach to the first mark was tight, with BMW ORACLE Racing ahead by just a few metres, with ALL4ONE charging hard towards them. 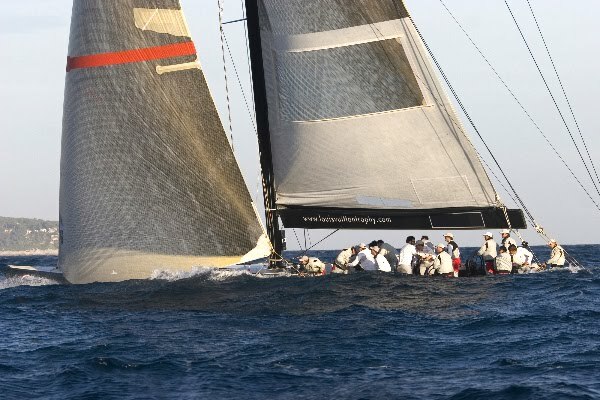 When helmsman Gavin Brady made the tack around the mark, the stern swung out and the Umpires judgement was that ALL4ONE had to take evasive action. A penalty was perhaps expected, but the team was surprised to see the red flag, indicating it would have be taken immediately. That meant dropping the spinnaker, raising the headsail, and making a clearing tack. By that time, ALL4ONE had streaked far ahead. The race was all but over. 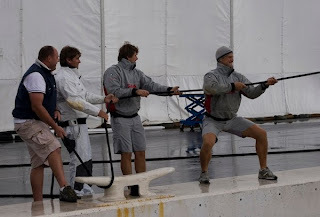 "We felt hard done by to be honest," said tactician Hamish Pepper as the team came off the water. It's a tough end to the regatta for the team. "We learned some valuable lessons here," he continued, emphasising the team would need more preparation to compete at the highest level. It's a shame as it was a stunning day on the waters off Nice. The wind and waves were up, and there were some great races. 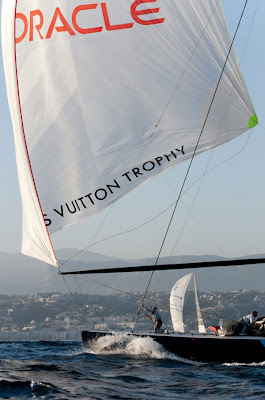 These images are from Paul Todd and Bob Grieser from the Louis Vuitton Trophy. 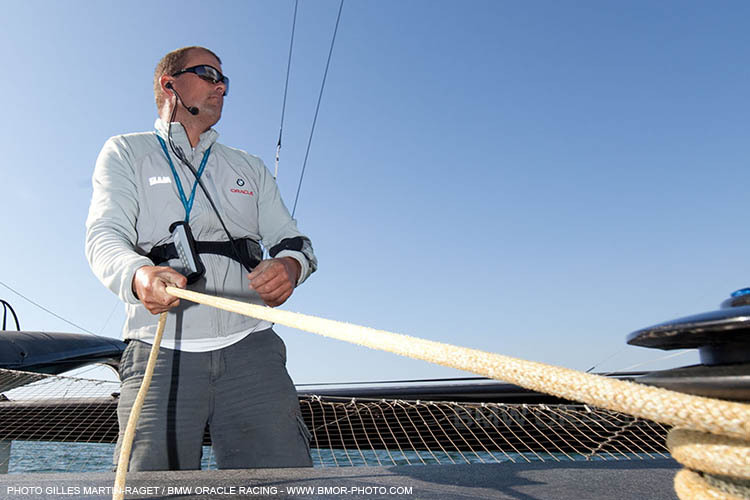 Racing continues through the weekend, with Emirates Team New Zealand, Synergy, Azzurra and TeamOrigin battling for the top four positions. Follow the action on the event website. 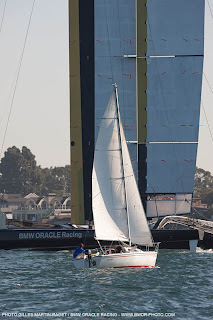 BMW ORACLE Racing won its morning match over Team French Spirit on Friday. 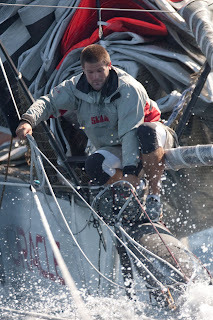 Conditions were tough with a wild sea state making it hard to work the boat around the race course. 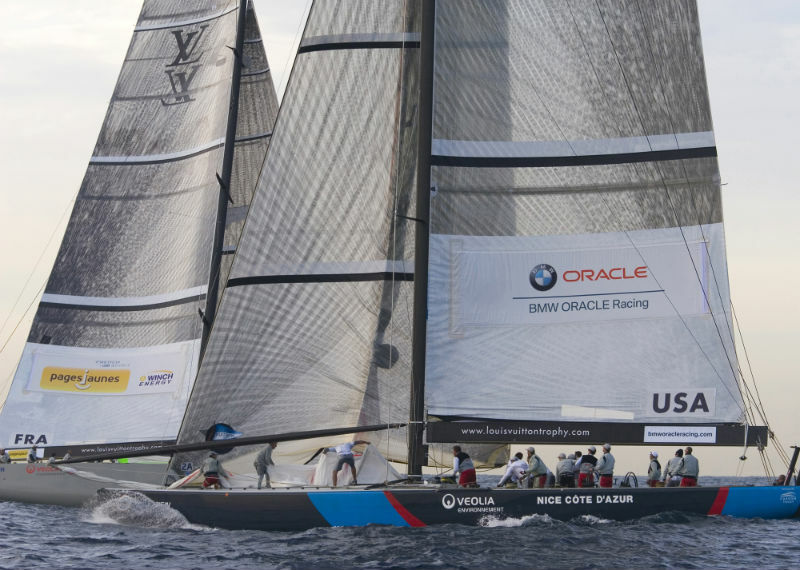 The win means BMW ORACLE Racing has one match remaining on the schedule. A win means a fifth place finish in the regatta while a loss drops the team to sixth. 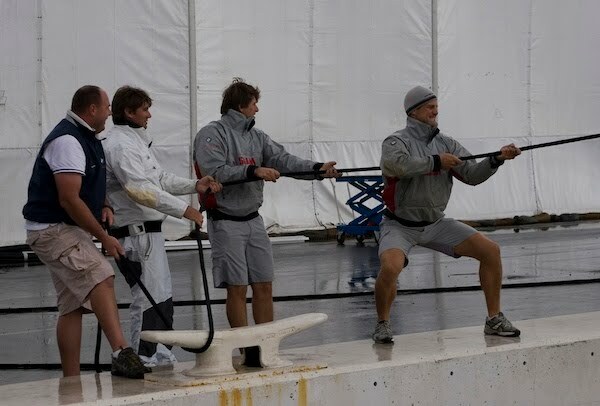 The guys are on shore in the middle of the day waiting for other matches to be finished before they return to sail their final race. 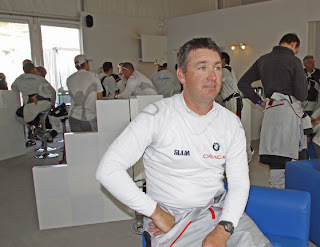 An old friend of the team, Troy Sears, was 18th man on board BMW ORACLE Racing at the Louis Vuitton Trophy in Nice on Thursday. 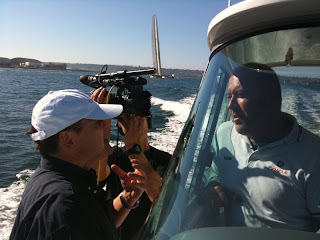 A big thanks to new friends of the team Matt and Keith from BTS Broadcast for the video. They've provided some great coverage of the Louis Vuitton Trophy on their YouTube page, including interviews with Shannon Falcone, coach Andrew Palfrey and Andrew 'Meat' Taylor. Check out their page here. The BOR 90 stayed inside San Diego Bay today providing many San Diegans a thrilling afternoon treat as the huge wing sail towered above the downtown waterfront as the BOR 90 tacked and gybed around the Bay. Sailing fans worldwide also were treated to the harbor sail as the Fox 5 San Diego web cam once again showed the action live. 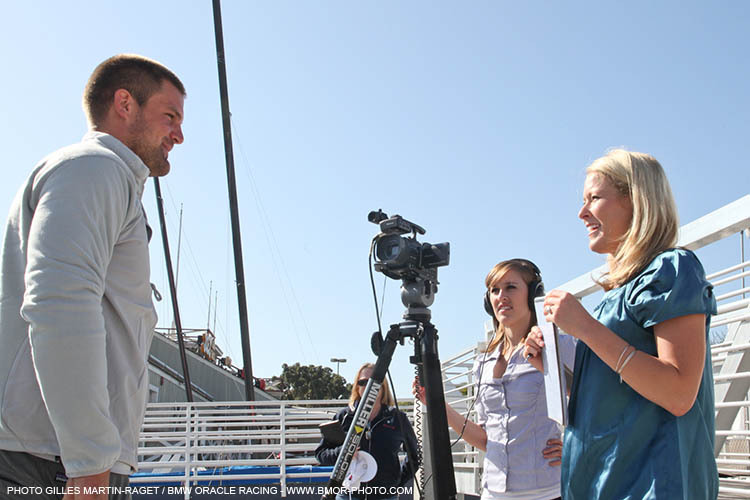 Before dock out today, the team was joined by Katie Conner and Emily James, broadcast journalism students at San Diego’s Point Loma Nazarene University. The students chose our team as a topic for their news reporting assignment. Simeon Tienpont (NED) happily volunteered for the interview. Unfortunately, only one match was sailed at the Louis Vuitton Trophy on Thursday as Azzurra beat Team Origin. 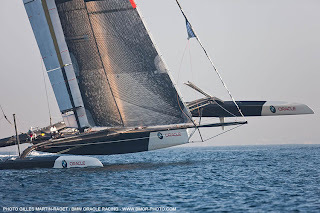 BMW ORACLE Racing's match against Team French Spirit was under a long postponement today before racing was abandoned for the day. The guys will try again on Friday - they're the first match on the schedule. 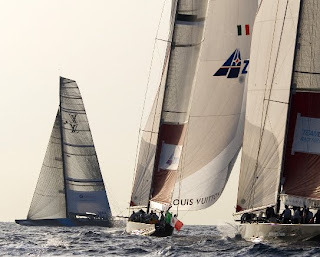 In the picture below, Origin trails Azzurra in the last breeze of the day. BMW ORACLE Racing can be seen tuning up in the background. 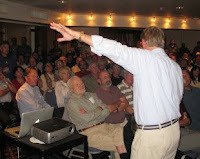 Tom Ehman, spokesperson for the GGYC and the team's minister of external relations, spread the word at the California Yacht Club on Wednesday night. 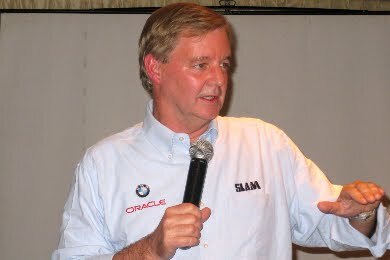 According to friend of the team Tom Leweck it was standing room only with more than 200 guests packed into the clubhouse. Given the opportunity, he said, they "would have stayed past midnight." With a 7am start off the mooring today, thermal underwear and knits caps were the most popular items of team kit this morning. As the days get shorter, even San Diego’s perpetual sunshine can’t remove the morning chill from the air. The guys tested some soft sails today taking a look at code zeros and gennakers for use with the hard wing sail configuration. “We had a good look at the sails and some nice upwind sailing today,” said Simeon Tienpont (NED). One of the great things the regatta organisers have done at the Louis Vuitton Trophy is to assign bicycles to all of the teams. 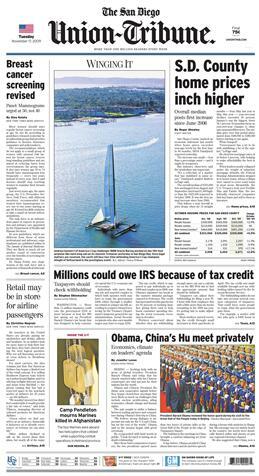 It suddenly puts the city within reach and cuts down on the commute time from the team hotels and apartments. In the case of BMW ORACLE Racing, that turns what would be a 20-minute walk at a brisk pace, into a 5-minute bike ride. 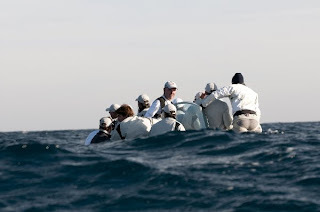 And those 15 minutes are important when the team is meeting at the boat at 07:00 to take advantage of early morning winds. The bikes themselves are heavy - they need to be sturdy as commuter bikes. After all, they're meant for short rides in the city. Well, nobody told that to our guys apparently. 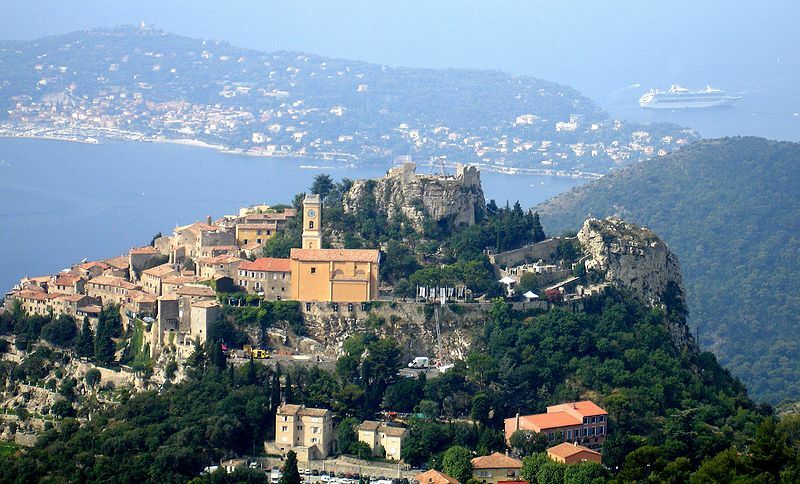 With a day off, some of the guys decided a bike ride to Monaco - about 20 kilometres away - was in order. 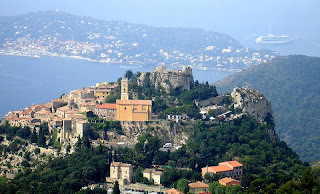 "Smitty (Alan Smith - NZL), Meat (Andrew Taylor - NZL), Flipper (Paul Westlake - AUS), Salty (Rob Salthouse - NZL) and myself rode to Monaco and then up to Èze (a mountain village about 500 metres above sea level) on the bikes," said Hamish Willcox (NZL). "The funniest part was catching and passing a serious local rider on his fully equipped road bike, decked out in all his cycling kit. He didn't seem amused when we went by on our machines." The guys will be back on a more familiar race course on the Bay of Angels on Thursday when racing is scheduled to resume. We're up against Team French Spirit. After a couple of maintenance days, the BOR 90 is ready to roll again, with the sailing team scheduled to be off the mooring by 0700 on Wednesday. The lower flap on the wing sail has been repaired, re-tuned and fitted to the wing again, under the watchful eye of team Technical Director Michel Marie (FRA). Dense fog is expected on San Diego Bay overnight, but it should clear in the morning, allowing the sailing team get out on the water for more testing. And from the UK paper The Times, comes a report from Mike Harvey, who visited the team in San Diego on Monday as part of a press trip for European media. 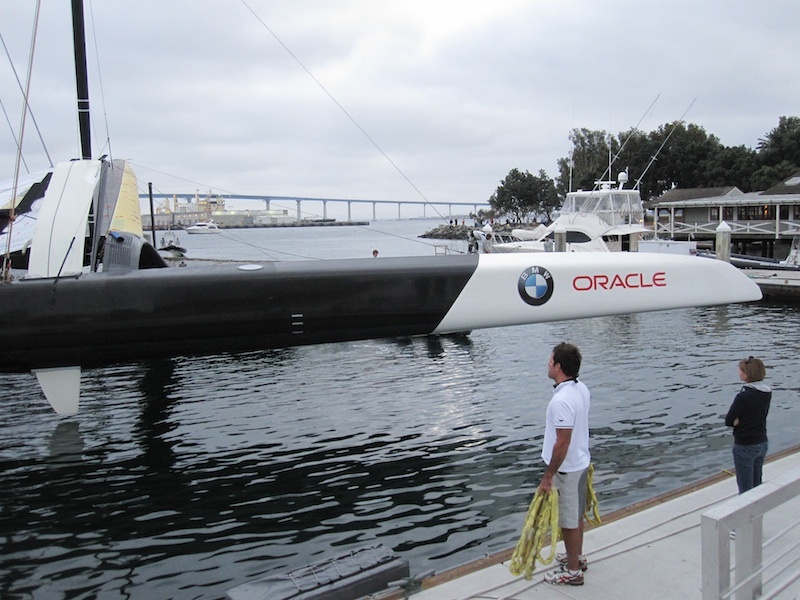 "The new America's Cup yacht from BMW Oracle is a monster. 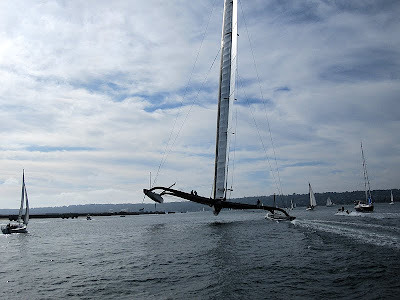 The BOR 90 is the most radical boat in the history of the 158-year-old regatta..." he writes. Read the full article here. 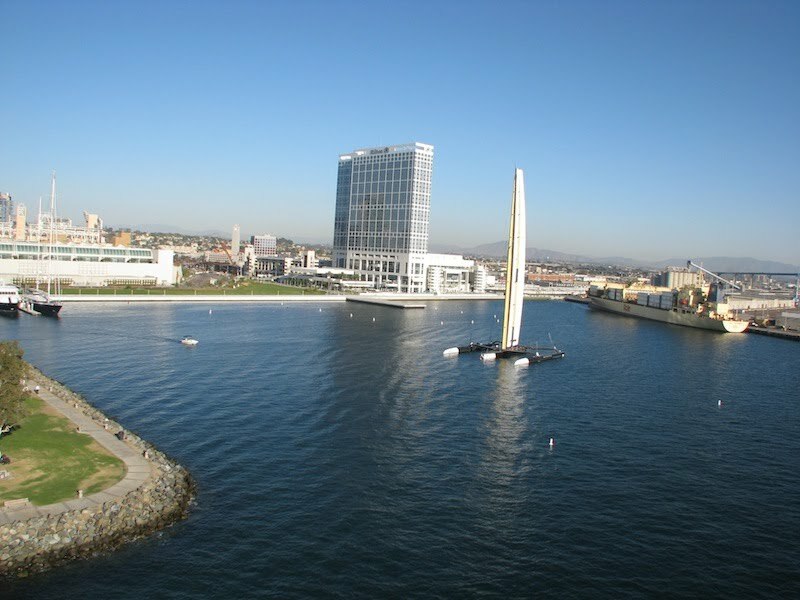 Sunday in San Diego …. 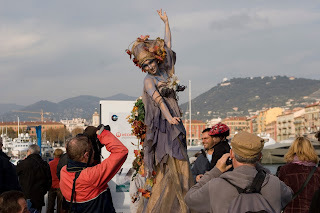 Hamish Willcox (NZL) Checks in from Nice …. Handover - "It's all yours"